DeVilbiss DeKups is a disposable cup system that replaces the use of traditional metal spray gun cups. The DeKups system eliminates the cost and labor associated with cleaning metal cups increasing painter productivity and reducing solvent usage. The DeKups system also eliminates the need for mixing cups and paint cans. The system is comprised of a disposable lid and liner that fit into a reusable frame. A mixing guide attaches to the side of the reusable frame and there are adapters to fit most spray guns. Filters fitting into the adapter allow for paint filtering during spraying. Available self venting funnels allows for refilling of the system. DeVilbiss DeKups is a disposable cup system that replaces the use of traditional metal spray gun cups. The DeKups system eliminates the cost and labor associated with cleaning metal cups increasing painter productivity and reducing solvent usage. The DeKups system also eliminates the need for mixing cups and paint cans. The system is comprised of a disposable lid and liner that fit into a reusable frame. A mixing guide attaches to the side of the reusable frame and there are adapters to fit most spray guns. Filters fitting into the adapter allow for paint filtering during spraying. Available self venting funnels allows for refilling of the system. 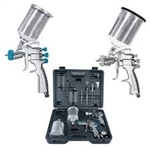 All-in-one DeVilbiss® Auto Paint and Priming System includes 2 HVLP spray guns—one for priming and one for top-coating This DeVilbiss HVLP 2-Gun Set is a great value from a brand name you know and trust. 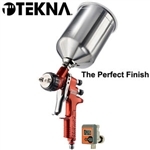 Complete, self-contained spray gun set includes 2 full-size HVLP spray guns to spray primers, colors, clears, and sprayable body fillers.